A World Class Town with at Small Town Feel! 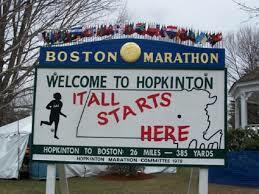 Hopkinton is a town in Middlesex County, Massachusetts, less than 30 miles (48 km) west of Boston. Interstate Route 495 divides the town into east and west zones, which are connected by numerous spokes providing direct access to the airport and other communities in the Greater Boston Metropolitan Area. Hopkinton is served by the Southborough MBTA Station, located on the border of Hopkinton and Southborough on Route 85 at Southville Road. MBTA commuter rail service is available to South Station and Back Bay Station, Boston, via the MBTA Framingham-Worcester Commuter Rail Line which connects South Station in Boston and Union Station in Worcester. Travel time to Back Bay is about 50 minutes. 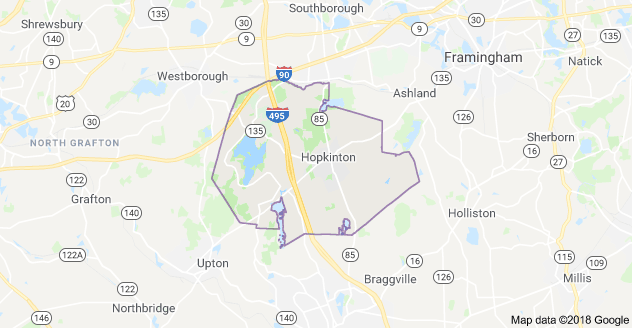 Hopkinton is a Member Community of the MetroWest Regional Transit Authority which provides local bus service to several towns in the MetroWest﻿ area, with service to the MBTA commuter rail station at Framingham. Boston's Logan International Airport is easily accessible from nearby Framingham. MassPort provides public transportation to all airport terminals from Framingham via the Logan Express bus service seven days per week. The bus terminal and paid parking facility are located on the Shoppers' World Mall property, off the Massachusetts Turnpike Exit 13, between Route 9 and Route 30, at the intersections of East Road and the Burr Street connector. The Worcester Municipal Airport, a Primary Commercial (PR) facility with scheduled passenger service, is easily accessible. The Historic Boston Marathon: Start of the Boston Marathon﻿ - Starting in 1924, when the Boston Athletic Association moved the starting line from Ashland, Hopkinton has garnered worldwide attention.